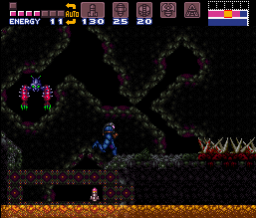 Metroid Grime: DS (not gonna say what "DS" means or it'd give away the storyline, but feel free to guess) is an upcoming full hack. Emphasis will be placed extensively on graphics and aesthetic detail, and the gameplay will focus more on action and exploration than puzzle solving. If all goes well, this game should be quite a bit larger and longer than the original. Depending how many free banks I have left by the time I finish remaking all 274 existing rooms, I'll keep adding more until I no longer have space. 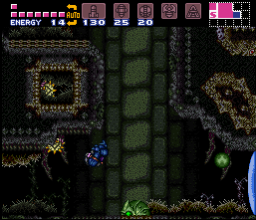 You can expect many secrets, shortcuts, alternate routes, item order and other things to boost replayability. This is not a challenge hack. 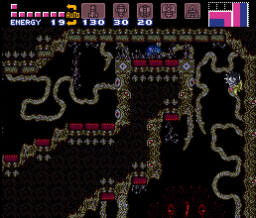 Difficulty will be on-par (but probably slightly harder in some instances) with the original Super Metroid as far as progressing through the game and finding your way. 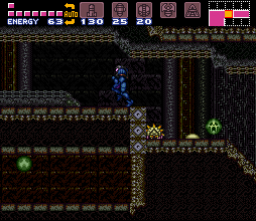 The only necessary skills to complete it will be wall jumping, mid-air morphing and basic shinesparking.